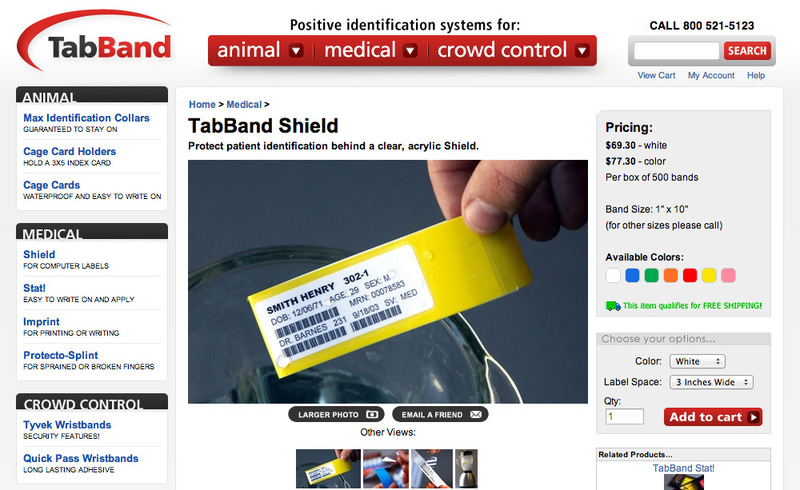 TabBand is a manufacturer of identification bands for animal, medical, and crowd control applications. 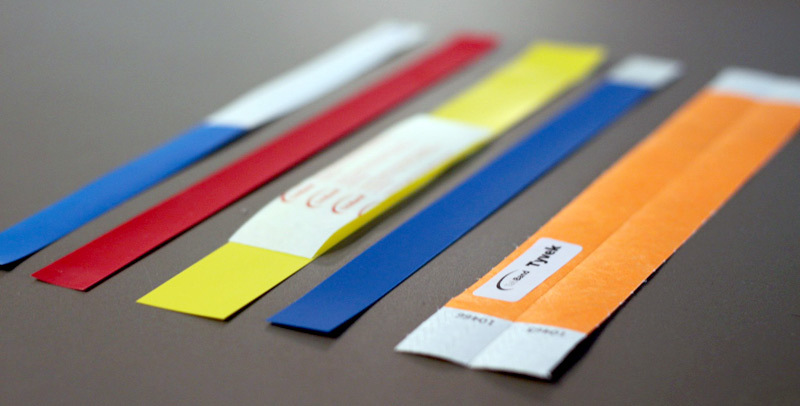 The company was founded in 1962 and recently set an amazing milestone of 1 billion identification bands sold. The company is based in Phoenix, AZ. The site homepage provides simple navigation that helps people find the type of product they need. We custom designed the entire web site experience including product information pages, company information, and ecommerce shopping cart. The custom design was rolled into the Volusion backend templates and gives TabBand a completely unique look that is unparalleled on the Volusion architecture. This version of the web site launched in 2011. The web site is built on top of the Volusion ecommerce system (learn more at volusion.com) and this system allows the TabBand team to receive orders, change and add products, and manage the entire business from their web browser. Product detail pages allow customers to see multiple photos, read product reviews, and view pricing information. We designed the site to be optimized for search engines from the start. We designed a sidebar navigation that contains keyword rich links as well as plenty of content areas to hold optimized content. We designed and implemented big drop down menus to make it simple to determine the exact product someone may need. We made it easy for people to browse by either product name, or by product type (since new customers may not know which product they need). 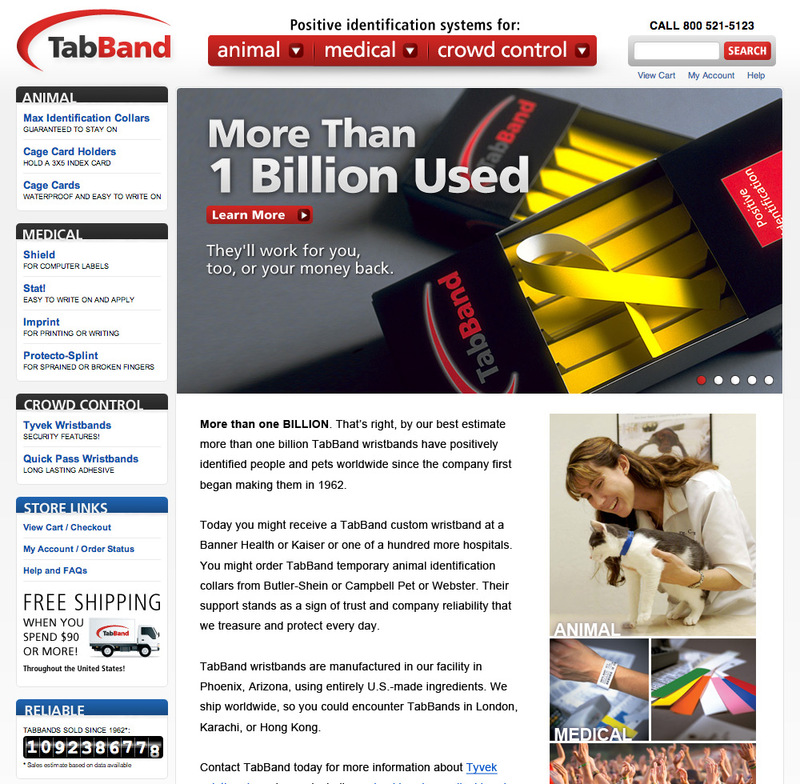 TabBand’s previous web site was over 10 years old, and the new web site has made an impact in helping to brand TabBand as the leader in the industry, and has turned their web site into a better sales tool for new customers. Tornado began working with TabBand in 2001 on their original web site, and we were thrilled to work with them again on this engagement.